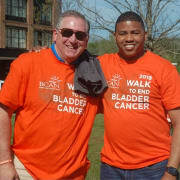 The BCAN Walk to End Bladder Cancer is the Bladder Cancer Advocacy Network's national grassroots fundraising and awareness initiatives that help support the BCAN mission: to increase public awareness about bladder cancer, advance bladder cancer research, and provide educational and support services for the bladder cancer community. We need volunteers to help with setup, registration, and maintaining the walk route. Come on out and support a great cause!